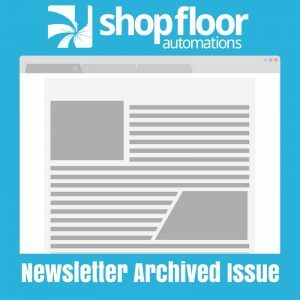 The following is an archived copy of our Shop Floor Automations Newsletter from January 2012. Happy New Year! We hope you are looking forward to 2012. Are your machines still using floppy disks? If you’d like them to enter the 21st century, we have Floppy Disk Emulators that work with virtually any CNC machine and eliminate the 3.5″ media on the shop floor that is plagued by dust, oil and chemicals. You are still limited to 1.44MB or 720KB for your files, but it will be much easier to transfer the NC programs on USB memory sticks with reliability. Easy to install, low cost and operation remains the same on the control. A year ago, one of our machine tool partners was trying to find a reliable solution for a customer who had several Haas CNC machines. They used 3.5” floppy disks to load NC programs on the machines. The media became difficult to find and costly to maintain the floppy drives. In July, they contacted SFA to see if we could help them. After our assessment, we recommended they use our Floppy Disk Emulator. The drive replaced the existing 3.5” disk drive and allowed the user to load NC programs from a USB memory stick with ease. The unit was installed by the end user and operation on the machine was the same. Within months, they ordered additional units for other controls used in the manufacturing plant and increased production by using a better method to transfer NC programs into the control. The differences between a Serial and Ethernet cable? Each one has its own ideal use. Serial is best for connecting your serial based CNC controls using DB25 or DB9 ports. Serial cable’s capability is limited in length and has connectors such as DB9, DB25, RJ45. Serial cables should use a drain wire for earth ground to prevent damage to the CNC control board. Ethernet is best for new machines that have a CAT 5 connection on them provided by the machine tool builder. Ethernet cables are recommended for long distances and available in category 5 and 6 and are typically used to connect network based equipment such as PCs, printers, routers and Windows based CNCs.